Filet mignon is sliced from the smaller end of the tenderloin although sometimes all types of tenderloin steaks are mistakenly referred to as filet mignon. The tenderloin contain less connective tissue than other muscles therefore it is more tender than other cuts of beef. The average heifer or steer provides no more than 500 grams of filet mignon. That is why this cut of beef is the most expensive. Filet mignon is typically seared on each side over intense heat for a short period of time and then cooked all the way through over a lower heat. It can be pan fried, grilled, broiled, or roasted. As fillet mignons have low level of intramuscular fat, they are often wrapped in bacon which keeps them from drying out while cooking and adds flavor. 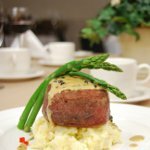 Filet mignon is typically served au poivre, in a red wine reduction, or in a cognac sauce. To celebrate National Filet Mignon Day, go out to your favorite restaurant and indulge yourself with a tender steak. You can also try your hand at cooking filet mignon at home and surprise your family with delicious steaks for dinner.